• The dtSearch product line can instantly search terabytes across an Internet or Intranet site, network, desktop or mobile device. • dtSearch products also serve as tools for publishing, with instant text searching, large data collections to Web sites or portable media. • Developers: add dtSearch instant searching and data support to your application. • APIs include native 64-bit APIs for .NET, C++ and Java. • Developer tutorials cover a wide range of topics, including an ASP.NET Core demo sample code walk-through. • The dtSearch Engine also works on cloud platforms like Azure and AWS. 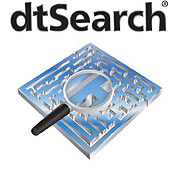 dtSearch Engine for Windows – Add dtSearch search features and built-in data support to your application; includes native 64-bit APIs for .NET, C++ and Java.